When President George H.W. Bush signed the landmark Americans with Disabilities Act (ADA) into law nearly 28 years ago, he eloquently declared, “Let the shameful wall of exclusion come tumbling down.” That was a watershed moment for our country. 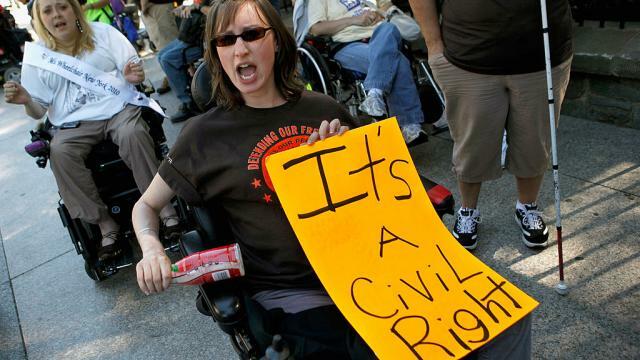 After decades of willful exclusion and benign neglect, people with disabilities finally secured the civil rights they deserved to be full participants in our great society. Those guarantees are now at risk. The House of Representatives will soon vote on H.R. 620, labeled the “ADA Education and Reform Act.” This bill could significantly reduce access for people with disabilities to stores, restaurants, hotels, doctors’ offices, social service establishments, private schools, and other places of public accommodation. In so doing, it would put a damper on opportunities for people with disabilities to participate as full and equal members of society. The ADA, which passed in 1990 with overwhelming bipartisan support, was carefully crafted to balance the concerns of businesses with the need to ensure access for people with disabilities. It did not require costly retrofitting of buildings built before the ADA; businesses were required to remove barriers in those buildings where that could be done without significant difficulty or expense. But the law contemplated that businesses that could easily remove barriers would do so. They would be accessible when people with disabilities showed up at the door, to shop, to obtain services, and to work. If H.R. 620 were to pass, many more people with disabilities would encounter barriers when they showed up and getting in would require a long and arduous process. That’s because H.R. 620 would eliminate any incentive for businesses to comply with the ADA proactively. A business that did not comply would face no consequence until after it received a legal notice from a person with a disability who was harmed, detailing the specific violation of the law. And then the business would have six months to do something about it and would merely be required to make “substantial progress” in removing barriers, instead of actually providing access. Twenty-eight years after the ADA was passed, it is unacceptable to roll back the civil rights of people with disabilities. We should ensure access, not progress. We should expect businesses to know and comply with their obligations, not require our neighbors and colleagues with disabilities to shoulder the burden of informing and educating businesses about those obligations. We should not turn the simple business of everyday life into a complex and lengthy ordeal for people with disabilities. H.R. 620 is also bad for business. The more than 57 million Americans with disabilities are an important customer base that businesses cannot afford to lose. Further, inaccessible businesses lose out on an enormous talent pool of employees with disabilities. Tom Ridge is founder and chairman of Ridge Global, as well as chair of the National Organization on Disability, a position he has held since 2006. He was America’s first secretary of Homeland Security and the 43rd Governor of Pennsylvania.